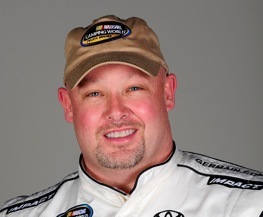 Todd Bodine on Friday afternoon won the pole for Friday night’s Camping World Truck Series race. Bodine, the series points leader, posted a time of 31.063 seconds at Chicagoland Speedway in Joliet, Ill.
His speed of 173.840 mph was a new track record. Austin Dillon was second quickest in the session with a lap in 31.097 seconds. James Buescher was next at 31.162 seconds. Kyle Busch, who won the truck, Nationwide and Sprint Cup races at Bristol last week, will start the EnjoyIllinois200.com. Rounding out the top five was Johnny Sauter.